Big, bold, brazen and most definitely beautiful, champion-sized onions and garlic don’t just look impressive – they have a refined taste to match, with a milder flavour that’s every bit delicious as their more diminutive cousins. Of course, big doesn’t always mean better, and it’s certainly the case that standard-sized bulbs are perfectly suited to most kitchens. But sometimes it’s just good fun to go large! So if you’re seeking the secret to heavyweight bulbs read on, but – spoiler alert – there’s really no magic involved, simply the right choice of variety, timing, good soil fertility and generous spacing. The availability of named varieties varies from region to region, so it’s with caution that I recommend specific varieties with a propensity for growing larger than life. However, any that include ‘Champion’, ‘Giant’ or suchlike in the name give a very unsubtle clue! ‘Kelsae’ doesn’t conform to this stereotype but is well worth seeking out. Typically started off from seed under cover in midwinter, ‘Kelsae’ grows some of the very biggest golden, globe-shaped onions about. It’s the one to go for if you’re looking to strain the scales. 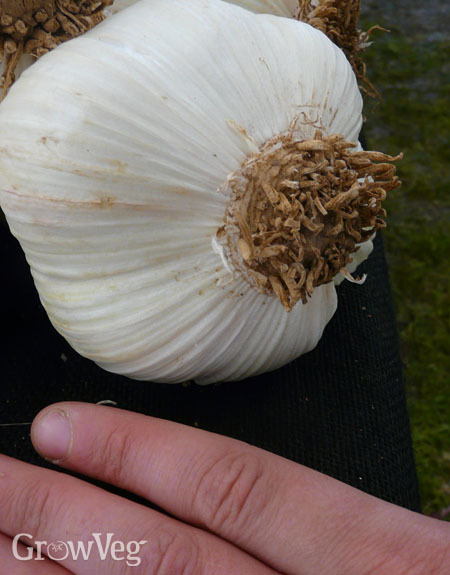 The appropriately named ‘elephant’ garlic isn’t a true garlic, but rather related to the leek. Its fist-sized bulbs have a milder taste that make it the ideal standalone dish. Roast the bulbs whole with olive oil, then serve with a pinch of rock salt between courses or as a decadent accompaniment – vampires beware! The biggest onions are started from seed in mid to late winter. This early start ensures vigorous seedlings that will be itching to explode into exuberant growth the moment they are planted out into rich, fertile soil. Sow them into module trays then thin the seedlings to leave just one to each cell. Plant them out once the soil has warmed up in mid to late spring. ‘Sets’ are small, immature bulbs about the size of a cherry. They offer a convenient way to grow onions because the juvenile stage is already taken care of. Perversely, planting sets too early can in fact result in smaller bulbs because this greatly increases the risk of the plant bolting, or flowering early, before the bulb has had a chance to fully swell. Onions bolt because excessive cold earlier on in the season fools the plant into believing it has just experienced a full winter. As a biennial crop that flowers in its second season, it will then go about initiating its blooms. In my temperate part of the world it’s generally safe to plant sets from mid spring. There’s still the occasional frost, but the weather is turning appreciably warmer by the day, which means the sets are fooled into thinking that the previous growing season is merely continuing. I plant my garlic in early autumn. The cloves sprout stubby shoots then sit through winter ready to reach up and out from spring. Not much happens above ground during the coldest months, but rest assured the roots below are developing apace. This groundwork is crucial for a strong start – and bigger bulbs – when the weather finally warms. In very cold climates you’ll need to wait till spring to plant garlic, but luxurious growing conditions will help plants play catch-up on autumn-planted cloves. If you’re not planting elephant garlic but want good-sized cloves from one of the hundreds of gourmet varieties available, be sure to plant only the very fattest cloves. There’s no mystery here: chunky cloves produce big bulbs. Big bulbs need plenty of space to stretch their legs, or rather roots. For both onions and garlic this means at least 15cm (6in) between each plant and 30cm (12in) between rows. Elephant garlic needs more like 30cm (12in) between plants in each direction. Planting closer than these recommendations will result in smaller bulbs. Moist, fertile soil in full sunshine will help plants to grow quickly and happily. Improve the soil with plenty of garden compost or very well-decomposed manure from a trusted source (you don’t want to run the risk of it containing any trace of herbicide). Soil for overwintered garlic can be further enriched by laying well-rotted organic matter between the plants in spring, just as the leaves start to put on fresh growth. Dry soil slows growth, so make sure to water in dry weather to keep the soil consistently moist (though never sodden). Don’t forget to remove weeds too, which will compete for moisture and nutrients. Carefully extracting weeds from around more mature plants is tricky; get in there early on in spring and never let weeds grow too large. You don’t want to accidentally pull up an onion bulb within a tangle of weeds (note to self: heed my own advice!). Super-sized bulbs are great fun to grow. If you’re reading this and reckon you have further tips on how to grow big bulbs, then please do drop me a comment below as I’d love to hear from you. "I've been wondering, garlic....can I plant from the garlic bulb I buy from my gardner producer or, do I need special bulbs from a nursery." "Garlic is best planted from bulbs bought specifically for planting - from a nursery or online garden supplier, for example. These will be far less likely to bolt (run to seed) and more likely to produce a good, usable bulb. That said, many people do grow from bulbs bought from the grocery store - there's just a bit more risk that they won't do quite as well. So my advice? If you have the space and don't mind taking a small risk, then try grocery store garlic. If you want to guarantee good strong plants with good bulbs, play safe with bulbs sold specifically for planting." "can cutting leaves on garlic promote larger bulbs ?" "I'ver never heard of cutting leaves to promote larger bulbs. Most of the energy for growing the bulbs will be coming from the sun captured by the leaves, so cutting them to aid larger bulbs doesn't really make sense. But, of course, others may have had other experiences."